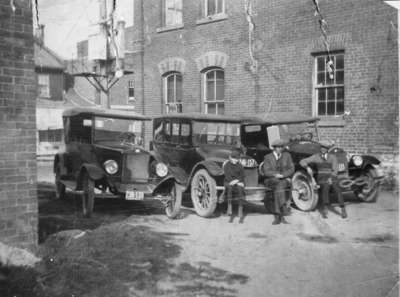 A black and white photograph of three taxis parked in a lot and three unidentified persons. Lloyd Dilling's Taxis was located at 113 Dundas Street West. Lloyd Dilling operated a fleet of taxis in Whitby in the early 1920s. Harold Boys later built his garage in this location. Lloyd Dilling's Taxis, Photographer Unknown, 1923. Whitby Archives 01-000-235.